Customer Effort Score (CES) is a powerful metric to measure customer service satisfaction with one single question. The underlying thought is that service organisations create loyal customers by reducing customer effort. 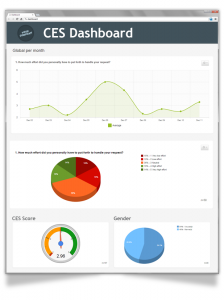 Our online survey tool lets you create a Customer Effort Score survey with a few clicks. You can follow your score and the results breakdown in real-time. Please note that the Customer Effort Score can be perfectly combined with a Net Promoter Score (NPS) question and/or CSAT questions. For more info check our article “CSAT, CES and NPS compared“. The CES question is available in our free <a href="https://www.checkmarket.com/survey-templates/">survey templates</a> and includes the <a href="https://www.checkmarket.com/embed-survey-question-in-email/">question embedded in the email invitation</a>. This will increase your response rate! Our system automatically calculates your CES results and the breakdown of the respondent types in real-time! 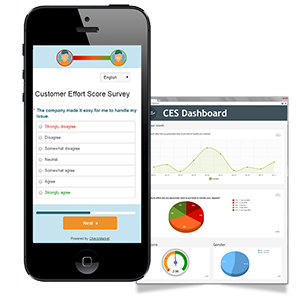 We have an automated workflow which includes follow-up surveys you can use in your organization to improve your CES. View your Customer Effort Score in real-time while you collect data. You can see the results of the Customer Effort Score in real-time. Generate native reports with the Customer Effort Score results in Excel, PowerPoint, Word, PDF, SPSS (fully-labeled) and CSV. CES is only a starting point. After the analysis, the real work can begin: improving your organization and taking actions to improve your CES. Get notifications for higher scores in real time. Translate feedback into actions to correct common complaints. Get everyone in your organization involved to improve your score. Measure, follow up and report continuously.